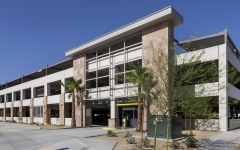 The East County Parking Structure in Indio, California provides much needed parking for the newly constructed County Courthouse building to the north. 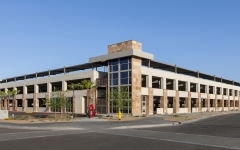 The three-level structure provides approximately 630 parking stalls for the public as well as secured parking for County Sheriff personnel. The design includes an elevator core located at the northwest corner of the structure containing two elevator cabs. The glass-backed elevator tower is an easily recognizable landmark to all users entering and exiting the site. Adjacent to the elevator core on the ground level of the structure are an office and conference room for County use. 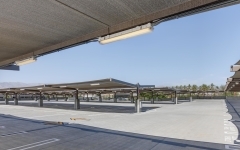 An overhead tensioned fabric structure provides shaded rooftop parking. The exterior design of the structure includes facade treatments designed to address aesthetic concerns while keeping in mind the realities of ongoing maintenance in the desert climate.